Court sports are lifetime sports, where anyone from children to seniors can learn and improve on their game. 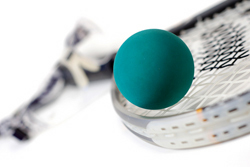 All court sports offered at Fore Court – Racquetball, Volleyball, and Wallyball - can be played at all levels on our three racquetball and sand volleyball courts. Experience the spirit of competition while achieving an exceptional cardiovascular workout. Fore Court will help you find a game or match you with one of our leagues.